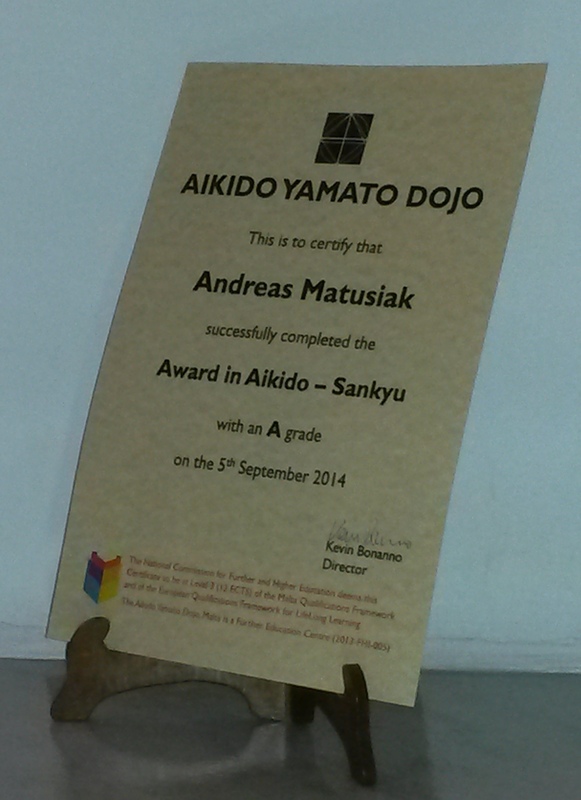 The Aikido Yamato Dojo provides study in the theory and practice of the Art of Aikido. At the dojo we teach, assess and promote practitioners against an established, detailed technical curriculum. The Aikido Yamato Dojo is a branch dojo of the French Buikukan-Provence Aikido school which is registered and accredited to French teaching standards. Aikido is regarded as a martial and a spiritual art. It goes beyond physical practice as it is aimed to reveal higher levels of mental abilities through martial practice. As a defensive martial art, the Aikido practitioner is trained to use the energy and momentum that an attacker offers in order to initiate a counter response. The energy is harmoniously neutralised and redirected back peacefully avoiding the use of forceful aggression. Aikido’s physical practice emerged from a combat regime and was refined through an evolution in its goals and approach by the Aikido founder, Morihei Ueshiba. Aikido is unique in the Martial Arts as it is specifically designed to counter aggression by peaceful means and to develop a harmonious center in the face of opposition. The techniques taught in Aikido are also recognised to be particularly useful in dealing with every-day challenges and ‘threats’ that one faces in the course of one’s working life where threats are likely to be more mental and less physical in nature. Through Aikido, participants are thought how to transform the stress of business, academic and family life into opportunities for personal growth and the development of compassion, discipline, concentration and self-confidence – while remaining calm and centered. Aikido is a practical method for conflict resolution, violence, bullying and teaches participants to connect with the world and remain connected and focused even under situations of utmost duress. The Aikido practitioner trains refined martial techniques as life-long practice and learns to apply qualitative studies to deal with various inner conflicts such as fear, aggression and anger. It is in all these aspects that the ‘Art of Aikido’ is a vehicle for one’s life-long education, mental and emotional balance and harmony. Our Mission is to create a sustainable and progressive community through the practice and principles of the Japanese martial art of Aikido. Provide a life-long path for learners who are willing to become Aikido practitioners in the society they live. We achieve this goal by guiding learners to success with integrity, quality and values. We will follow a quality assurance policy based on the European Quality Assurance Framework. We will strive to apply, maintain and review this policy in accordance with the fast growing needs in society. The Aikido Yamato Dojo is a Further Education Centre licensed by the National Commission for Further and Higher Education (2013-FHI-005). 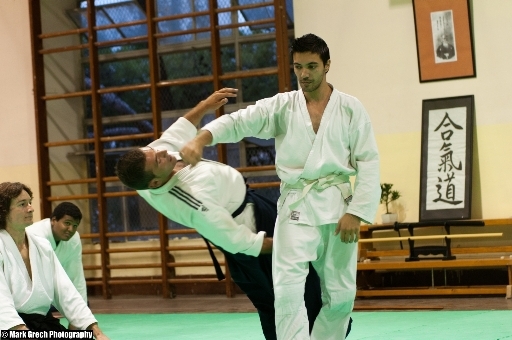 The Aikido Yamato Dojo has developed specific courses with qualifications that have been evaluated and accredited by the NCFHE according to the Malta Qualifications Framework (MQF) and the European Qualifications Framework (EQF). The centre follows a quality assurance mechanism that implies having internal quality systems for transparency and standards for learning and teaching. The accredited courses are taught through diverse methods, including lecture, demonstrations, theory, readings, practical based sessions, seminars and supervised independent learning. Courses are made of various modules aimed to award the participant with practical, hands-on, collaborative and experiential learning with focus on technical and mental practice. Learning shall be attained in formal, informal and non-formal ways through adult education practices. Throughout the practical based seminars participants will be also taught by experienced masters of the Art. In each course the participant will be guided according to an established technical program. This course aims to help the learner to understand the framework of Aikido. The participant is introduced to the basic concepts and to the way Aikido is studied and practiced. Special focus is on safety, harmony and correct Etiquette. The participant is exposed to basic skills and techniques and s/he will be able to demonstrate them with a partner at the end of the course. The course consists of 4 modules having 6 credits (ECTS). The modules are the Theory, Warming-Up, Skills and Techniques. A recommended reading list is provided. The participant is expected to participate in one approved local Aikido practical seminar, pass the examinations, assessments and have a minimum of 85% course attendance for the eligibility of this Award. The course consists of 4 modules having 8 credits (ECTS). The modules are the Theory, Footwork, Skills and Techniques. A recommended reading list is provided. The practitioner is expected to participate in two approved local or foreign Aikido practical seminars, pass the examinations, assessments and have a minimum of 85% course attendance for the eligibility of this Award. 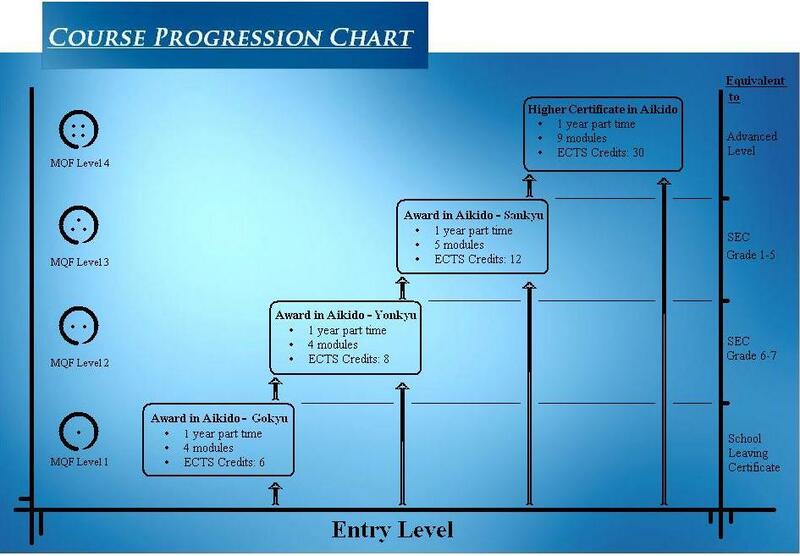 The course consists of 5 modules having 12 credits (ECTS). The modules are the Theory, Footwork, Skills, Weapons and Techniques. A recommended reading and video lists are provided. The practitioner is expected to participate in two approved local or foreign Aikido practical seminars, pass the examinations, assessments and have a minimum of 85% course attendance for the eligibility of this Award. The Award will be given with a grade according to the overall average mark of the modules. This qualification aims to provide the practitioner technical development, knowledge, skills and training needed to be independent, actively response and confident in movements and techniques as a young martial artist. The course consists of 9 modules having 30 credits (ECTS). The modules are the Theory, Seminars, Skills, Weapons and various technical modules. A recommended reading and video lists are provided. The practitioner is expected to participate in three approved local or foreign Aikido practical seminars pass the examinations, assessments, write an assignment and have a minimum of 85% course attendance for the eligibility of this qualification that is given with a grade. The entry requirement for the Award in Aikido – Gokyu at MQF level 1 is one must be at least 15 years of age. When the participant obtain this qualification can proceed to the next qualification at MQF level 2 and so on to MQF level 3. There is also the direct route for participants that are already experienced in Aikido. Any prospective Aikido learner interested in these academic Aikido qualifications needs first register with the Aikido Yamato Dojo.